What? That’s it! This was my reaction when I finally found out what Anushka Sharma and Deepika Padukone Lehenga cost. I’m sure you’ve all read something somewhere about the tentative price. But let me tell you, all of that was wrong! Like *miles* apart. A little birdie (God bless her soul) reached out to me this morning on Instagram. She recently visited the Sabyasachi store in search of her own wedding lehenga. Now we all dream of owning a Sabyasachi lehenga. But when you finally enter that temple that is the Sabyasachi bridal store, one can’t help it. You gotta ask the question. Just how much do I really need to stretch to get my hands on that Anushka Sharma wedding lehenga? Or maybe I can pick Deepika Padukone’s red lehenga from her Sindhi wedding for my own? What do Sabyasachi Lehengas generally cost? Not 20, and definitely not INR 30 Lakhs as reported earlier. Just to give you a general idea of Sabyasachi lehenga prices. Most of the Sabyasachi bridal lehengas that you see brides wear typically costs between INR 4 Lakhs to INR 7 Lakhs. Sabyasachi’s pre-wedding lehengas i.e. the lighter lehengas usually cost under INR 3 Lakhs. But most of the other bridal lehengas with a default two dupattas will cost you a cool INR 3.95 Lakhs. So given that information, Anushka Sharma’s 8.75 Lakh Sabyasachi bridal lehenga is pretty decent. After all, she is an A List Bollywood actress and producer. 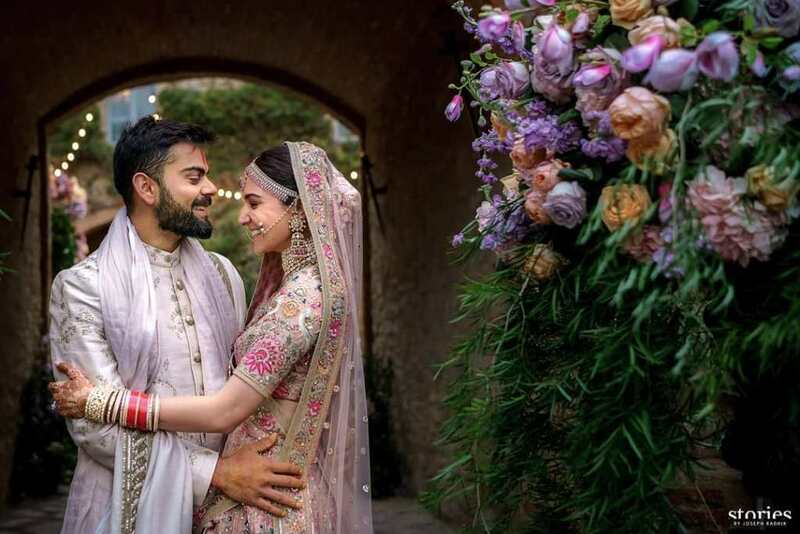 I think Anushka Sharma Virat Kohli was the first celebrity wedding of the year that really got everyone excited. From nobody knowing anything about it, to finally seeing such heart warming pictures of the couple from their special day. It was truly magical. For her wedding, Anushka Sharma wore a gorgeous blush pink silk lehenga. The actress was dressed head to toe in Sabyasachi wearing Sabyasachi heritage jewellery. To complement the pale pink lehenga, the bride wore traditional jewellery—a mathapatti, layered necklaces and jhumkas in jadau, pearls and pink spinel. Now, I understand paying INR 9 lakhs is no joke. Not everyone can afford it. But that’s how things are. I am a firm believer of no replicas. But that doesn’t mean you can’t achieve the similar look for less. Check the link below for similar designer lehengas from 50k to under INR 1.5 Lakhs. Deepika Padukone Lehenga Cost is INR 12 Lakhs! Honestly, not surprised. The Bollywood actress’s outfit was gorgeous. Love at first sight for many if I may say. It was a custom one of a kind Sabyasachi traditional lehenga that won our hearts. If there was one wedding look that took me by surprise, it’s got to be this. Deepika Padukone’s Sabyasachi wedding lehenga was an instant love. There were so many personal details on this one to love. From the chants inscribed on the dupatta border, to the Ott bridal jewellery, Deepika Padukone looked no less than a royal queen. Its a shame that we don’t have the full picture of her Anand Karaj wedding lehenga. But nevertheless, lets all assume the lehenga is pretty perfect. The colour red, specifically sindoor red, plays a very dominant role in traditional Punjabi wedding imagery. Aari-taari, zardosi, tilla-ka-kaam, salma-sitaara, gota, badla, kiran- all come together with traditional motifs of flora and fauna to create wedding classics. Statement necklaces, proud tikas, chaandbalis, kadas and bangles, choodas, kaliras, juttis and parandhis contribute to the powerful imagery. In my research for reviving sarees from Varanasi, I came across a lot of wedding sarees which had “सदा सौभाग्‍यवती भव” written on them, which translated means, “may you always be blessed with good luck and prosperity.” The beauty of traditional Indian textiles is how it tells the story of fables and parables, tradition and religion, myths and truths beautifully through the lens of the textile design and weaving community. Sindoor red, hand-woven and hand-dyed silk matka lehenga set with an aari-taari odhna and zardosi detailing. The authenticity of the look is magnified by pure silver kiran, dipped in 22 karat gold. Traditional wedding jewellery with uncut diamonds and pearls offsets the strong red with feminine, yet robust detailing. Which wedding lehenga was your favourite? Anushka Sharma’s or Deepika Padukones? I was wondering when we will get to see brides replicating the Bollywood starlets lehenga design. At least here, we get to see a little more clearly the wedding outfit. It even has inscriptions on the kamar. Pretty cool, eh? But here’s the twist. If you notice the bridal jewellery, it actually is quite similar to another big fat wedding. Remember Shloka Mehta’s Ambani Wedding? Now I know it’s not the exact same bridal jewellery. But pretty similar no?